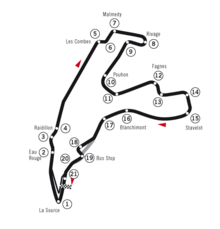 The 1993 Belgian Grand Prix was a Formula One motor race held at Spa-Francorchamps on 29 August 1993. It was the twelfth round of the 1993 Formula One season. Damon Hill scored a second successive victory. Alain Prost was leading the race and looked set to win, but a miscommunication during his second pitstop cost him time and he dropped behind Hill and Michael Schumacher. Williams's 1–3 finish clinched the Constructors' Championship for the team. Lotus driver Alex Zanardi was withdrawn from the meeting following a huge crash in Friday practice, which ultimately ended his season. In the race itself, his team-mate Johnny Herbert scored the final points ever for Team Lotus with his 5th position. Local driver Thierry Boutsen retired from Formula One following the race (he retired on the first lap with a gearbox failure). ^ "1993 Belgian Grand Prix". formula1.com. Archived from the original on 2 December 2014. Retrieved 23 December 2015. ^ a b "Belgium 1993 - Championship • STATS F1". www.statsf1.com. Retrieved 13 March 2019.